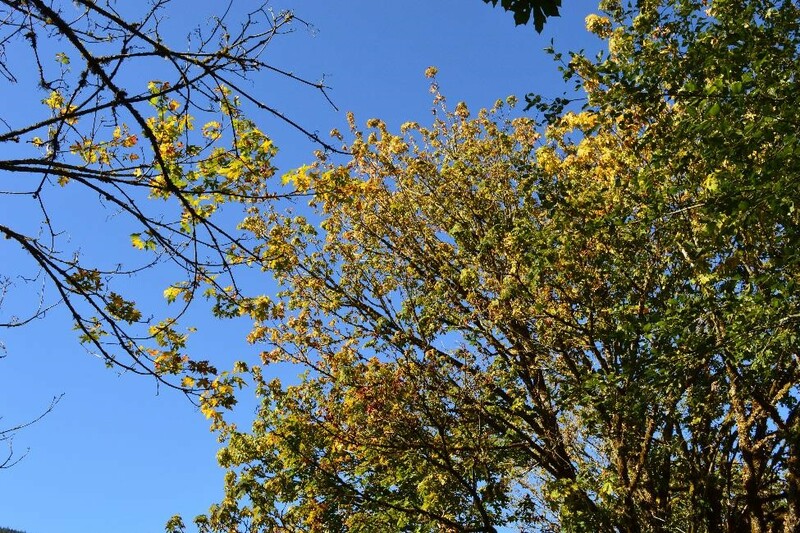 This article is an update to those published by the Tree Link in October 2014, “Bigleaf Maple Dieback in Western Washington?”, and the follow-up articles in September of 2015, ” What’s Going on with Bigleaf Maple?“, and in August 2016, “Bigleaf Maple Decline, Update and Next Steps”. WHAT COULD BE CAUSING THE DECLINE IN BIGLEAF MAPLES (ACER MACROPHYLLUM)? Crown dieback, thinning, reduced leaf size, and discoloration in bigleaf maple tree. Photo by Jacob Betzen. As of the end of 2018, there was no sign of recovery in sick and dying bigleaf maple throughout Western Washington. Forest pathologists at Washington DNR have been investigating the increase in mortality and symptoms in bigleaf maples since 2011, when numerous calls from concerned members of the public and land managers began coming in. Symptoms of the decline include partial or entire crown dieback, discoloration and reduced size of the leaves, crown thinning, and death. These are all common signs that something is amiss with the tree, either from drought, root disturbance, chemical imbalance, or pathogen. Decline in bigleaf maples has also been reported throughout the tree’s entire geographic range, including in California, Oregon, and British Columbia. Initial surveys did find several pathogens, such as Phytophthora, Armillaria, Neonectria, Nectria, and Ganoderma, but none were found in enough of the declining bigleaf maple to suggest that they were the primary cause of the decline. There was some initial interest in Xylella fastidiosa, but subsequent tests gave inconclusive results. Leaf hoppers have also been found on bigleaf maple trees, but they have not yet been conclusively linked to decline either. With funding from the USDA NIFA McIntire-Stennis Cooperative Forestry Program, scientists from the University of Washington investigated the spatial patterns and environmental variables associated with decline, while the DNR forest pathologists continued searching for a pathogen responsible for the decline. The research project at the University of Washington involved sampling forest plots throughout the range of bigleaf maple in Washington state, during the summer of 2017, and taking measurement and observations of the plot, including the health of the bigleaf maple within the plot. In addition to resampling the original DNR survey locations, which were chosen specifically because they contained declining bigleaf maple, randomized plots on public lands were included. The use of randomized plots selected without bias were critical in efforts to correlate decline with environmental variables or conditions. By combining these measurements with National Land Cover Database and PRISM Climate Data, it was found that decline in bigleaf maple was associated with increased human development, proximity to roadways, as well as hotter, drier summers. Decline was also found to be present across age and size classes. 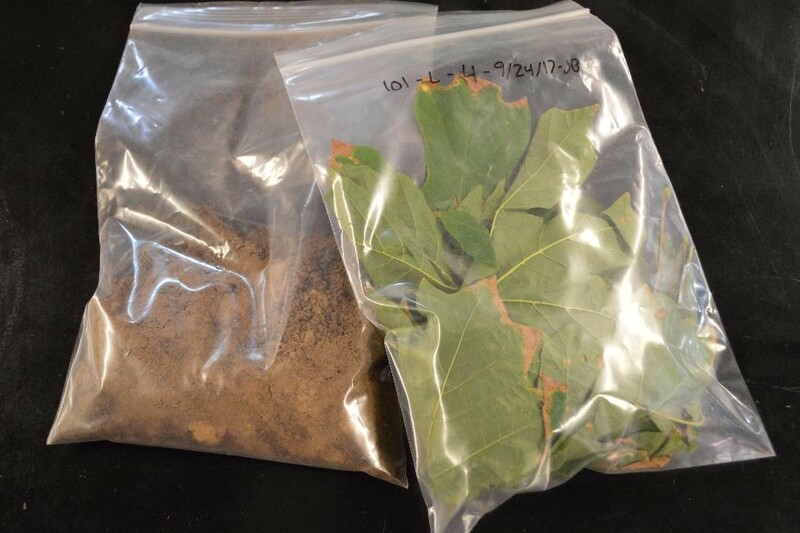 Soil and leaf samples used for elemental concentration analysis. Photo by Jacob Betzen. Leaf samples from healthy and declining trees, and soil samples from healthy and declining plots, were analyzed to determine elemental concentrations. If a toxic pollutant or nutrient imbalance were to blame for the decline, a correlation between bigleaf maple and decline and elemental concentrations should be found. While several correlations were found between decline and elements, there were conflicting results between different types of analyses, and substantial overlap between the concentrations in healthy and declining trees. Based on this analysis, no pollutants can be conclusively implicated as a cause of the decline. 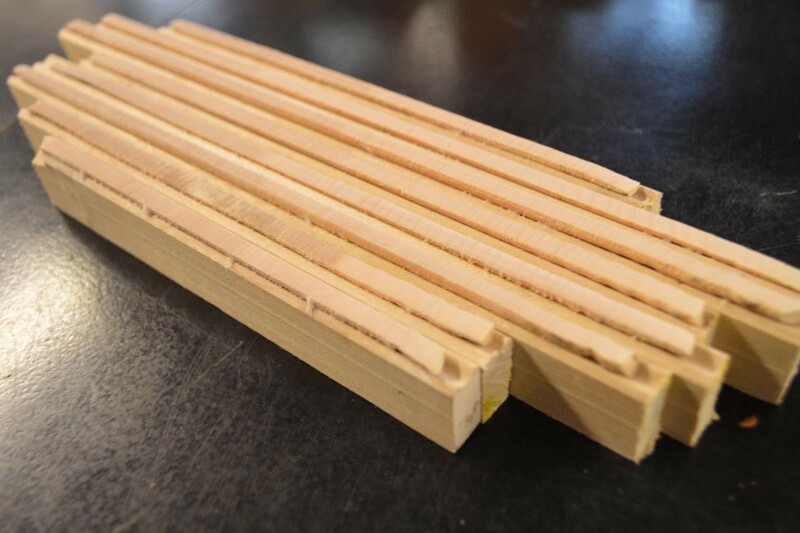 Processed tree cores used for dendrochronological analysis to estimate timing of decline among trees. Photo by Jacob Betzen. By taking tree cores from bigleaf maple, and measuring the width of the rings, the spread of decline in bigleaf maple throughout time could be estimated. In the case of a pathogen or insect that spreads throughout the range of a host, it should take shape of a spreading bullseye pattern, unless it is introduced in many locations in quick succession. However, the results of the tree ring analysis did not show any such pattern indicative of a traditionally spreading pathogen or insect. In conclusion, the results show a link between bigleaf maple decline and increased human development, as well as higher summer temperatures and more extreme summer droughts, all of which are predicted to increase in the future. While not able to conclusively rule out a pathogen or pollutant as the cause of bigleaf maple decline, the results of this study did not find any evidence supporting either. If you have any questions or comments about this project, please contact Jake Betzen, the masters student who undertook the project and author of this article at: betzen@uw.edu, DNR Natural Resources Scientist Dan Omdal at: daniel.omdal@dnr.wa.gov, or Patrick Tobin, an Associate Professor at the University of Washington at: pctobin@uw.edu.